Beer, generically, is any alcoholic beverage produced through the fermentation of starchy material and which is not distilled after fermentation. The process of beer production is called brewing. Because the ingredients used to make beer differ from place to place, beer characteristics such as taste and colour vary widely, and consequently its type or classification. One of the oldest beverages man has produced, dating back to at least the 5th millennium BC and recorded in the written history of Ancient Egypt and Mesopotamia, the character of beer has changed drastically over the millennia. The brewing industry is now a huge global business, and today consist mostly of conglomerates formed out of a multitude of smaller producers. While beer is generally an alcoholic beverage, some varieties exist, originated in the Western world, which undergo a process to remove most of the alcohol, producing what is called non-alcoholic beer. A typical mug of lager beer, showing the golden colour of the beer and the foamy head floating on top. Beer is one of the world's oldest prepared beverages, possibly dating back to the early Neolithic or 9500 BC, when cereal was first farmed, and is recorded in the written history of ancient Egypt and Mesopotamia.Archaeologists speculate that beer was instrumental in the formation of civilisations. As almost any substance containing carbohydrates, namely sugar or starch, can naturally undergo fermentation, and it is likely that beer-like beverages were independently invented among various cultures throughout the world. In Mesopotamia, the oldest evidence of beer is believed to be on a 6000-year-old Sumerian tablet depicting people drinking a beverage through reed straws from a communal vessel, a bowl. Beer is also mentioned in the Epic of Gilgamesh, and a 3900-year-old Sumerian poem honoring the patron goddess of brewing, Ninkasi, contains the oldest surviving beer recipe, describing the production of beer from barley via bread. Beer became vital to all the grain-growing civilizations of classical Western antiquity, especially Egypt and Mesopotamia. Beer was important to early Romans, but during Republican times wine displaced beer as the preferred alcoholic beverage. Beer became a beverage considered fit only for barbarians; Tacitus wrote disparagingly of the beer brewed by the Germanic peoples of his day. The addition of hops to beer for bittering and preservation is a relatively recent innovation: in the Middle Ages many other mixture of herbs were often employed in beer prior to hops, and is often referred to as gruit. Hops were cultivated in France as early as the 800s. In Europe, beer largely remained a homemaker's activity, made in the home in medieval times. By the 14th and 15th centuries, beermaking was gradually changing from a family-oriented activity to an artisian one, with pubs and monasteries brewing their own beer for mass consumption. In 15th century England, an unhopped beer would have been known as an ale, while the use of hops would make it a beer. Hopped beer was imported to England from the Netherlands as early as 1400 in Winchester, and hops were being planted on the island by 1428. The popularity of hops was at first mixed — the Brewers Company of London went so far as to state "no hops, herbs, or other like thing be put into any ale or liquore wherof ale shall be made — but only liquor (water), malt, and yeast." However, by the 16th century, "ale" had come to refer to any strong beer, and all ales and beers were hopped. In 1516, William IV, Duke of Bavaria, adopted the Reinheitsgebot, perhaps the oldest food regulation still in use today. The gebot ordered that the ingredients of beer be restricted to water, barley, and hops, with yeast added after Louis Pasteur's discovery in 1857. The Bavarian law was applied throughout Germany as part of the 1871 German unification as the German Empire under Otto von Bismarck, and has since been updated to reflect modern trends in beer brewing. To this day, the gebot is considered a mark of purity in beers, although this is controversial. Most beers until relatively recent times were what is now called ales. Lagers were discovered by accident in the 16th century after beer was stored in cool caverns for long periods; they have since largely outpaced ales in terms of volume. With the invention of the steam engine in 1765, industrialization of beer became a reality. Further innovations in the brewing process came about with the introduction of the thermometer and hydrometer in the 19th century, which allowed brewmasters to increase efficiency and attenuation. Prior to the late 18th century, malt was primarily wood-roasted, which contributed a darker colour and smoked flavour; the use of coal lightened beer colour and eliminated the smoke flavour for all but a handful of styles. The invention of the drum roaster in 1817 by Daniel Wheeler allowed for the creation of very dark, roasted malts, contributing to the flavour of porters and stouts. The discovery of yeast's role in fermentation in 1857 by Louis Pasteur gave brewmasters methods to prevent the souring of beer by undesireable microorganisms. In 1953, New Zealander Morton W Coutts developed the technique of continuous fermentation. Morton patented his process which revolutionised the industry through reducing a typical four-month long brewing process to less than 24 hours. His process is still used by many of the world's major breweries today, including Guinness. Of the two terms, beer and ale, the latter is the elder in English. It is believed to come directly from the proto-Indo European root *alu-, through Germanic *aluth- ( (http://www.bartleby.com/61/roots/IE14.html)). 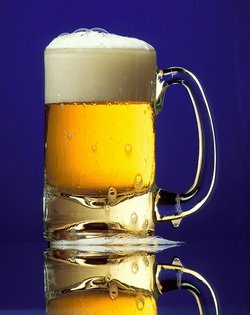 Beer, on the other hand, is considered to come from the Latin bibere (to drink,  (http://www.bartleby.com/61/69/B0156900.html)). Old English sources distinguish between "ale" and "beer," but do not define what was meant by "beer" during that period, although there is some speculation that it refers to what would now be called cider, the alcoholic form. The Old English form of "beer" disappeared shortly after the Norman Conquest, and the word re-entered English centuries later, in exclusive reference to hopped malt beverages. The beverage is termed "cerveza", or a derivative, in the various dialects of Spanish and Portuguese. Most other Western European languages use a form similar to the English "beer." The main ingredients of beer are water, malted barley, hops and yeast. Other ingredients, such as flavouring or sources of sugar, are called adjuncts and are commonly used; this usually comprises fruit or other grains. Because beer is composed mainly of water, the source of the water and its characteristics have an important effect on the character of the beer. Many beer styles were influenced or even determined by the characteristics of the water in the region. Among malts, barley malt is the most widely used owing to its high amylase content, a digestive enzyme which facilitates the breakdown of the starch into sugars. However, depending on what can be cultivated locally, other malted and unmalted grains are also commonly used, including wheat, rice, maize, oats and rye. A relatively recent addition to beer, hops contribute a bitterness that balances the sweetness of the malt, and also have an antibiotic effect that favours the activity of brewer's yeast over less desirable microorganisms. The bitterness of beers is measured on the International Bitterness Units scale. A specific yeast is chosen depending on which type of beer is being produced, the three main kinds being ale yeast, lager yeast, and wild yeasts. Yeast is used during the fermentation process to metabolise the sugars extracted from the grains, and produces alcohol and carbon dioxide as a result. On average, beers' alcohol content is between 4% and 6% alcohol by volume, although it can be as low as 2% and as high as 14%. Some brewers add one or more clarifying agents to beer that are not required to be published as ingredients. Common examples of these include Isinglass finings, obtained from swimbladders of fish, and Irish moss, a type of red alga. Since these ingredients may be derived from animals, those concerned with the use or consumption of animal products should obtain specific details of the filtration process from the brewer. Though the process of brewing beer is complex and varies considerably, the four basic stages that are consistent are outlined below. In general, there is also a filtration step before and after each stage. Mashing: The first phase of brewing, in which the malted grains are ground and soaked in warm water in order to create a malt extract. Boiling: The extract is boiled along with any remaining ingredients (excluding yeast) to create the wort. The hops are placed in bags and brewed like tea, or a hop extract is added. Fermentation: The yeast is added and the beer is left for at least a week in order to facilitate fermentation. Like most fermented drinks, the beer may be allowed a second fermentation, called conditioning, which gives the beer a more complex taste. Packaging: At this point, the beer contains all of its alcohol, but not very much carbon dioxide. The brewer has a number of options to increase carbonation, such as directly adding CO2 gas and kegging the beer, or adding extra sugar and re-fermenting ("kreusen") while bottled. After brewing, beer must be stored in some form suitable for shipment and consumption. Usually at this point the beer is a finished product, but some beers will contain live yeasts and are stored for further conditioning, allowing harsh elements in the beer to attenuate. This is especially the case in some bottle-conditioned Belgian ales and cask-conditioned real ales. Typically, beer is either kegged, to be served on tap, or bottled, usually on highly-automated bottling lines. Cheaper mass-marketed brews are often stored in aluminium cans. The conditions of serving has an enormous impact on the drinker's experience. The most important factor is temperature: colder temperatures inhibit the chemical senses of the tongue and throat, which prevents the drinker from experiencing the full depth of the beer. Conversely, beer served too warm may have the opposite problem: strong beers in particular start tasting too alcoholic and harsh, while lighter beers may seem flat and unappealing. Every style has an ideal serving temperature, and while casual drinkers may be accustomed to "ice-cold beer" as perpetuated in mass-consumption advertising, learning the appropriate serving temperature of beer styles can lead to a much more rewarding drinking experience. Besides temperature, choosing an appropriate container is also important. While casual drinkers of cheap beer often drink beer straight out of the bottle or can, craft beers are always poured. Drinking out of a bottle virtually eliminates the beer aromas picked up by the nose, which are just as important as the flavours picked up by the mouth. So whether on tap or from a bottle, the beer is first poured into a glass, mug, or stein. As with wine, there are specialised styles of glassware for each style of beer, and some brands of beer even produce glassware intended for their own beers. While any glass is preferable to a bottle, aficionados claim that the shape of the glass influences the perception of the aroma and the way in which the beer settles, similar to claims by drinkers of brandy or cognac. Lastly, the pouring process is important to a beer's presentation. The rate of flow, how the glass is tilted, and whether the beer is poured in the center or down the side of the glass all influence the end result, such as the size and longevity of the head, the lacing (the pattern left by the head as it moves down the glass as the beer is drunk), the turbulence of the beer and its release of carbonation. Guinness in particular, along with other stouts, is leisurely poured in two stages, with a pause to allow settling. Some bottle-conditioned beers have a yeast sediment at the bottom of the bottle that may be undesirable, while beer tapped directly from a keg or cask may require special treatment. A method pioneered by Guinness is the nitrogen tap, which introduces tiny bubbles of nitrogen into the beer as it is poured. There are many different types of beer, each of which is said to belong to a particular style. A beer's style is a label that describes the overall flavour and often the origin of a beer, according to a system that has evolved by trial and error over many centuries. According to the type of yeast that is used in the beer's fermentation process, most beer styles fall into one of two large families: ale or lager. Beers that blend the characteristics of ales and lagers are referred to as hybrids. An ale is any beer that is brewed using only top-fermenting yeasts, and typically at higher temperatures than lager yeast (15–23°C, 60–75°F). Because ale yeasts cannot fully ferment some sugars, they produce esters in addition to alcohol, and the result is a more flavourful beer with a slightly "flowery" or "fruity" aroma resembling but not limited to apple, pear, pineapple, grass, hay, plum or prune. Stylistic differences among ales are more varied than those found among lagers, and many ale styles are difficult to categorize. Lagers are the most commonly-consumed category of beer in the world. They are of Central European origin, taking their name from the German lagern ("to store"). Lager yeast is a bottom-fermenting yeast, and typically undergoes primary fermentation at 7-12°C (45-55°F) (the "fermentation phase"), and then is given a long secondary fermentation at 0-4°C (30-40°F) (the "lagering phase"). During the secondary stage, the lager clears and mellows. The cooler conditions also inhibit the natural production of esters and other byproducts, resulting in a "crisper" tasting beer. Modern methods of producing lager were pioneered by Gabriel Sedlmayr the Younger, who perfected dark brown lagers at the Spaten Brewery in Bavaria, and Anton Dreher, who began brewing a lager, probably of amber-red color, in Vienna in 1840–1841. With modern improved fermentation control, most lager breweries use only short periods of cold storage, typically 1–3 weeks. Most of today's lager is based on the Pilsner style, pioneered in 1842 in the town of PlzeH, in the Czech Republic. The modern Pilsner lager is light in colour and high in carbonation, with a mild hop flavour and an alcohol content of 3–6% by volume. The Budweiser brand of beer is a typical example of a pilsner.